I come from the Coastal region, Mkuranga district, Kisiju ward, Binga village. I am disabled. I was not born disabled but at the age of 5 years I contracted polio and ended up as I am today. I went to school at primary level from the 1982 to 1988. My parents and relatives were friendly/congenial and loving, I was never segregated. My teachers and other pupils were all good to me. All the pupils at this Salvation Army School were disabled therefore no one could notice any difference. After primary school I went to Vituka Yombo Tailoring School where I learned tailoring. 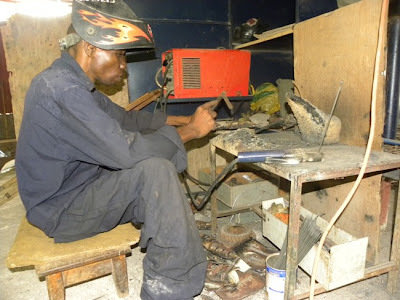 Then I went to VETA Chang’ombe and learnt welding fabrication, which is what I am doing now. After VETA I have worked in several garages for the past five years and later I applied for this job at Wonder Welders. My relationship with my family is good. My future plans and expectations are to have a good life for my family, eg. to obtain my own house.